“Garzas” is Spanish for herons, and you’ll see the white birds roaming freely in the Andalusian-style courtyard of the Presidential Palace (Palacio de las Garzas) in Panama City. The African herons were a gift celebrating the completion of renovations of the palace in 1922, but they’re not the only famous residents; the President of Panama lives in the upper floors of the building. 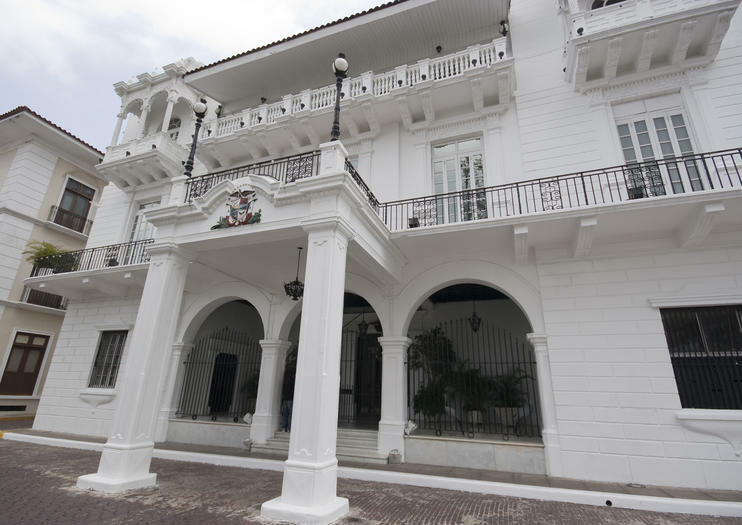 Originally built during the seventeenth century when Panama was under control of the Spanish crown, the neoclassical white mansion in Casco Viejo was a customs house for a time before its conversion into the official presidential residence in 1922. To see inside the palace (and catch a glimpse of the President’s pet birds) you’ll need to reserve a free tour at least two weeks ahead of time. If you don’t have a tour booked, some guards might let you peek into the courtyard. Enjoy a sightseeing tour of the Panama Canal and view the notable landmarks of Panama City with a knowledgeable guide. Drive through historical areas like Casco Viejo (Old Quarter), famous for its plazas, parks and Spanish colonial architecture. Visit Paseo Las Bóvedas and witness Miraflores, one of the Panama Canal’s impressive locks, including a stop at the Miraflores Visitor Center. Your tour includes lunch and a visit to the Amador Causeway for incredible vistas over the city and canal.